Headed to the range with your prized AR-15? You will need some quality ammo. 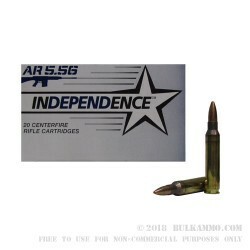 This ammunition is produced by Independence, a subsidiary of ATK, and is loaded with a 55 grain FMJ-BT bullet. 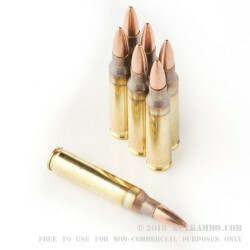 This bullet type is the standard for range training, combat drills, and 3-gun shooting competitions. The boat-tail design of these bullets help to reduce the effects of wind-drift and yaw, increasing the accuracy over long ranges, as compared to non-boat tail bullets. 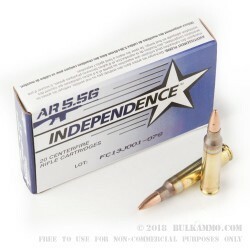 This load will also closely match that of 55 grain varmint hunting rounds which are becoming increasingly popular with coyote hunters. Each round uses a Boxer primer and a reloadable brass case.